Arthur has enjoyed being worn in a sling since he was a week old. Like many babies he suffered from reflux and the 'fourth trimester' need to be held close. Keeping baby in an upright position after feeding can really help with reflux and wind and increases the bond between mother/father and baby by encouraging skin to skin contact. This helps your little one to regulate their body temperature, breathing and heart rate. Young babies should only be worn facing inwards with their head fully supported. During the day at home, and whilst Arthur was small I wore him in a stretch sling which was comfortable so sit and lie back in, isn't too rigid and allowed you to stroke your baby through the material. The sling was so easy to use, I would have it on ready over my clothes and just popped Arthur in whenever he needed a cuddle or whenever I needed both hands! For trips out - or travelling (we carried Arthur in a sling at the airport rather than a pushchair) we chose the Ergobaby 360 carrier. When he was small we used the new baby insert (pictured). 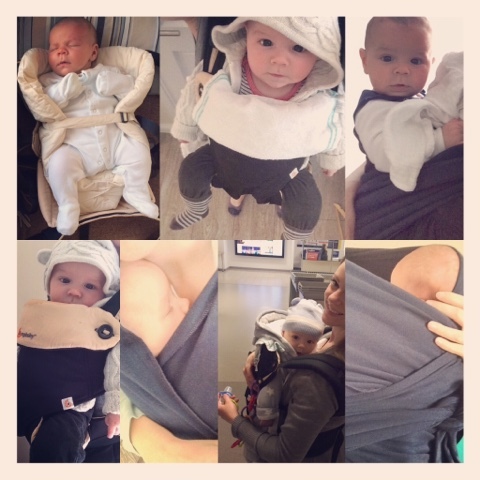 The Ergobaby can be worn on the front facing in or out, on the back (we have yet to master this!) or on the side/hip. Arthur loves to face outwards so he can watch the world and see what we are up to... If he gets tired I simply adjust the buttons and turn him around. Both of these style of slings have been used by Mummy and Daddy!